As we approach the fiftieth anniversary of Apollo 11 and wonder how in the world we got to the Moon, let’s erase the lines between the histories of aviation and spaceflight. The Apollo astronauts were all pilots. It was a NASA rule back then. Pilots flew the Mercury, Gemini and Apollo missions. The Neil Armstrong biography, First Man,and now its movie adaptation, make it clear that the “first man” was a pilot first—and foremost. Flying was Neil Armstrong’s passion, and he brought all of his experience to the surface of the Moon. With that in mind, we can see that the Museum’s history of the Moonshot doesn’t begin in the space galleries, it only culminates there. The rest of the story is all around you. Armstrong’s descent to the surface of the Moon began with his first solo flight. It was 1945 and he was 15, flying an Aeronca Champ, a 65 hp two-seat, tube and fabric plane not very different from the Museum’s World War II Aeronca L-3B. He became a naval aviator in 1950 after training in the North American SNJ, which is the Navy’s name for the T-6 Texan (our own Texan is at the Restoration Center). During the Korean War, he flew combat missions in Grumman’s first jet fighter, the F9F Panther. The Panther was the straight-wing version of the Museum’s F9F-8 Cougar. 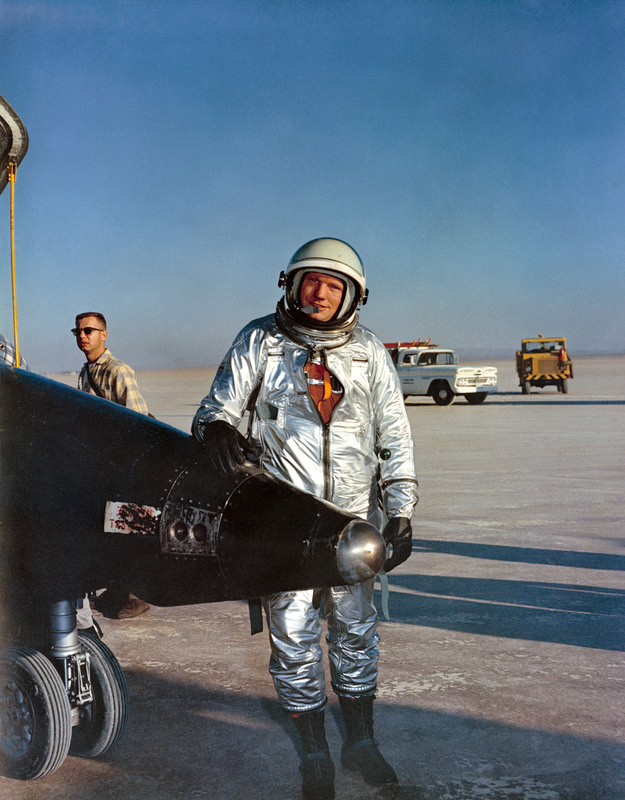 In 1955 Armstrong moved to the Mojave Desert to be a test pilot with NASA’s predecessor, the National Advisory Committee for Aeronautics (NACA) at Edwards Air Force Base. Perfect timing. The skies of the Right Stuff were filled with a breathtaking variety of new supersonic fighters and experimental research aircraft. NACA and NASA research pilots (the agency’s preferred term for test pilots) were expected to be proficient in them all, including the support planes. The NACA became NASA on Oct. 1, 1958, and the research flights didn’t miss a beat. Still in his twenties, Armstrong flew the agency’s modified P2B-1S mothership, Douglas RF-4D, North American F-51D, plus the North American F-86 and Lockheed F-104. And those were just the planes used to support research flights! Armstong’s research flights put him in the cockpits of jets like the Boeing B-47 and McDonnell F-4. He also had some time in the X-5, a swing-wing experimental plane that paved the way for the Grumman F-14. At age 30, Armstrong became the seventh pilot to fly the greatest rocket plane of them all—the North American X-15. He logged seven flights during the next 20 months, with missions over 200,000 in altitude and nearly 4,000 mph. In the meantime he flew really low and slow with NASA’s pioneering parawing hang glider, Paresev. And using a Douglas F5D, he developed emergency glide-flight profiles for the proposed Boeing X-20 Dyna-Soar spaceplane. Speaking of soaring, in his spare time Armstrong was an avid glider pilot. In 1962 Armstrong left Edwards to be an astronaut. And then he flew spacecraft, too. Want to learn more about Neil Armstrong's flight to the Moon? Check out our newest exhibition Destination Moon: The Apollo 11 Mission! 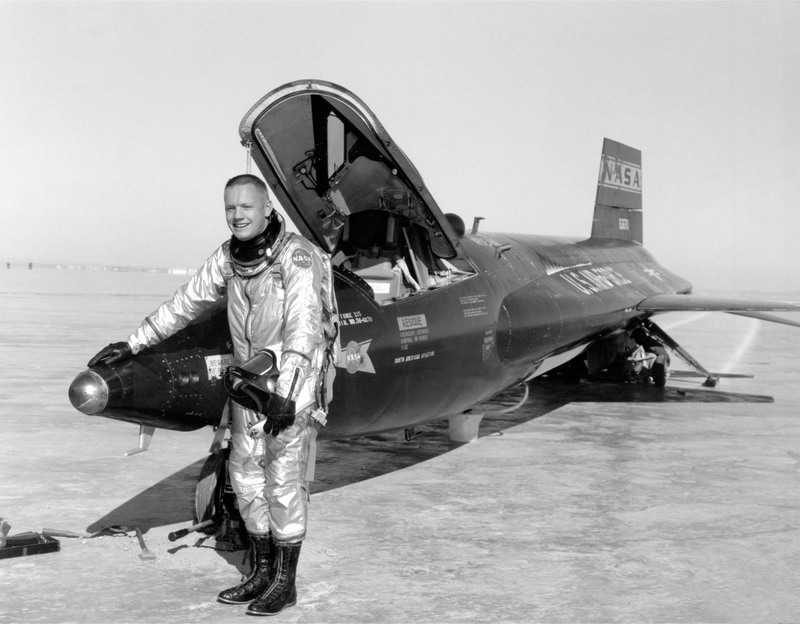 Neil Armstrong and X-15. NASA. Armstrong at a California gliderport, eager to begin a flight in an ASK-21 sailplane. Ted Huetter. S63-19148 (1963) Neil A. Armstrong. Edwards Air Force Base. *This article was previously published in Aloft Nov/Dec 2018.